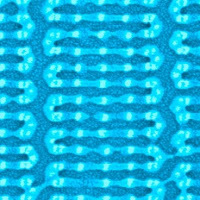 MIT researchers coaxed tiny, chainlike molecules to arrange themselves into complex patterns, like this one, on a silicon chip. Previously, self-assembling molecules have required some kind of template on the chip surface — either a trench etched into the chip, or a pattern created through chemical modification. But the MIT technique instead uses sparse silicon “hitching posts.” The molecules attach themselves to the posts and spontaneously assume the desired patterns. Image: Yeon Sik Jung and Joel Yang. The features on computer chips are getting so small that soon the process used to make them, which has hardly changed in the last 50 years, won’t work anymore. One of the alternatives that academic researchers have been exploring is to create tiny circuits using molecules that automatically arrange themselves into useful patterns. In a paper that appeared Monday in Nature Nanotechnology, MIT researchers have taken an important step toward making that approach practical.